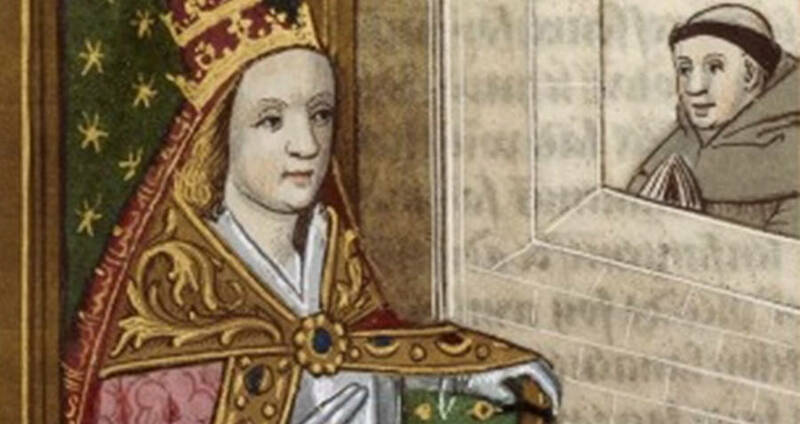 Despite being denied by the Church, many people still believe there may have been a Pope Joan. Wikimedia Commons A French illustration of Pope Joan. Since the dawn of Catholicism, the highest office in the religion has been the Pope. Whoever holds it serves as the leader of the entire religion, and the closest thing mere humans have to a divine link. Of course, since Peter the disciple was crowned the first pope by Jesus Christ, all 266 popes have been men. However, legend has it that one woman slipped through the cracks, and worked her way up the religious ranks to become pope. For hundreds of years, many people, both devout Catholics and conspiracy theorists alike, believed that Pope John VIII, who served in the 9th century, was actually a woman named Joan. Word of Pope Joan first appeared in the 13th century and spread widely through Europe. The most widely accepted version of the legend is that she dressed as a man to visit her lover at the Church, which ultimately sparked her interest in religious studies. She then devoted herself entirely to them, quickly becoming well known as an educated man. As most thought of her as an accomplished man, she rose through the ranks of the Church hierarchy and was eventually elected pope. It was only revealed that she was a woman after she became pregnant, and gave birth during a procession. According to legend, she died shortly after, either by murder or complications from the birth. 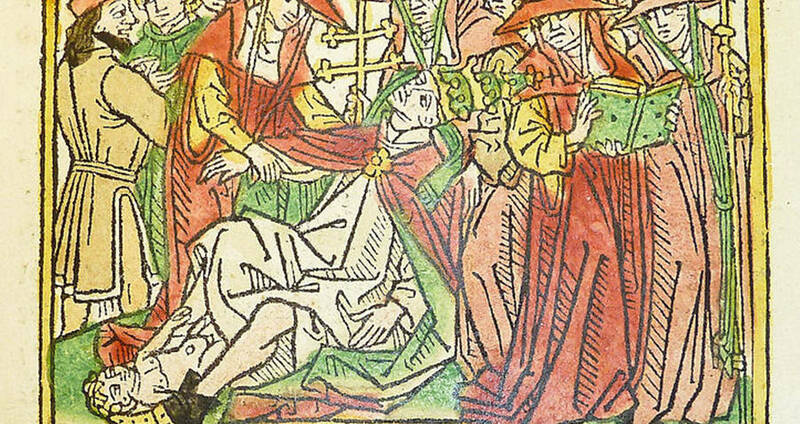 Wikimedia Commons An illustration of Joan giving birth during the procession. It was said that God punished the people for letting a woman enter the papacy. Petrarch wrote of the horrors that occurred after her womanliness was revealed in his Chronica de le Vite de Pontefici et Imperadori Romani . The legend of Pope Joan was recorded by more than just Petrarch. Bartolomeo Platina, the prefect of the Vatican Library, wrote an excerpt in his book, allegedly at the request of Pope Sixtus IV, that detailed how Joan ascended to the office. He claimed that there was no one more qualified than her and that upon the death of Pope Leo IV, Joan was chosen by “common consent” during the Conclave. He also corroborated the story of Joan’s death. For two hundred years, mention of Pope Joan popped up in art and literature, most of which lined up with the original legend. Countless authors through the years set out to prove she existed, publishing articles and books on the subject, and even creating historical timelines that supported her existence. There was even a ceramic bust of Joan, inscribed Johannes VIII, Femina ex Anglia, that was on display in the Duomo di Siena along with busts of the other popes. Then, in 1601, Pope Clement VIII declared the legend to be untrue, ordering the bust removed and replaced by a definitively male pope, Pope Zachary. The Church officially denies the existence of a female pope. Many historians have argued that the woman who gave birth during the procession in which Joan was supposed to have been revealed was most likely actual Pope Urban VIII’s niece. They also argued that the timeline doesn’t fit, and had there actually been a female pope she would probably have existed between 1086 and 1108, not the 13th century. 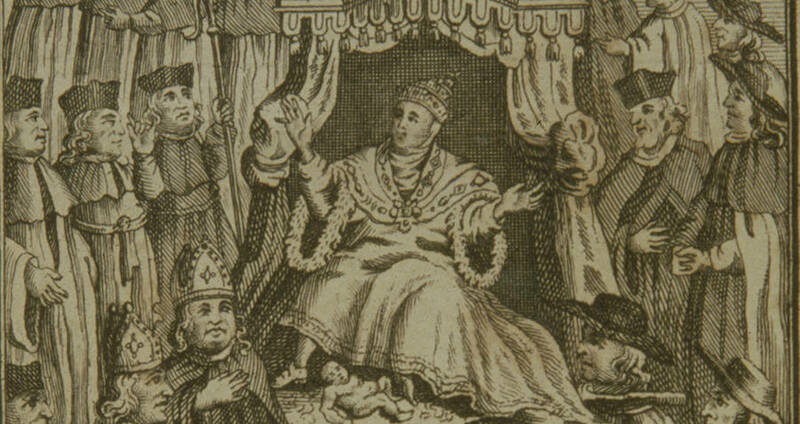 During those years the Vatican was occupied by Henry IV, the Holy Roman Emperor, and the papacy was highly contested. Historians have pointed out that several men had staked their own individual claims to the throne, making it easy to believe that a woman could also have done so. Despite the Church’s denunciation of Pope Joan, many people are still believers. 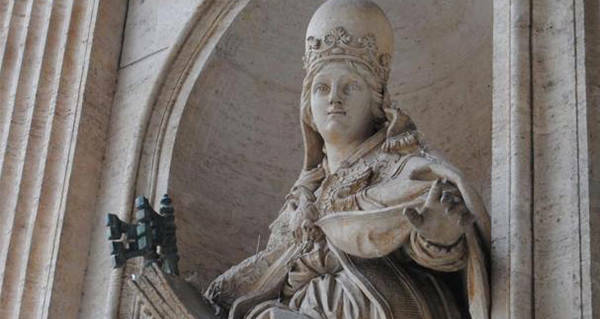 It is widely believed that the statue in Rome, Joanna With A Papal Crown depicts Pope Joan. Enjoy this article on Pope Joan? Next, read about the Phantom Time Hypothesis that claims that the Middle Ages didn’t exist. Then, read about the history of the Holy Roman Empire.